Synopsis: The Kincaids are an old-money family, a tight-knit bunch, and the elderly Kincaid spinsters see themselves as the guardians of the family reputation. When niece Donna Kincaid (Brenda Joyce) begins working a lot of late hours with married attorney Wayne Fletcher (Lon Chaney, Jr.) they are scandalized, and demand that she quit her job. Donna refuses. She doesn't care what they think; she is in love with Fletcher, and knows that he is unhappy in his marriage. In fact, when he drops her off at the Kincaid mansion that night he tells her that he is going to have a "showdown" with his wife Vivian, who has recently fallen under the influence of a psychic named Julian Julian. But when Fletcher returns home he finds the place swarming with police. His wife has been murdered -- smothered with a pillow. A pillow of death! 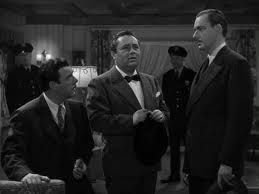 Police detective McCracken carries out a leisurely investigation, and though there's a lot of circumstantial evidence pointing at Fletcher, there are other suspects too. What about that table-tipping fake Julian, who is worming his way into the confidence of the Kincaid sisters? Or Bruce Malone (Bernard Thomas), the weaselly peeping Tom who is nursing an infatuation with Donna? 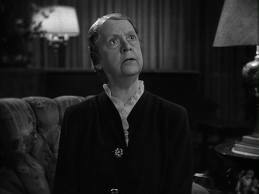 Or sour old Belle Kincaid, who was the last person known to have seen Vivian alive? And as long as we're asking questions, what about the chain-rattling ghost heard in the attic? Or the secret passage in the house that even Donna doesn't know about? Or the voice Wayne keeps hearing -- the voice of his dead wife that keeps pleading with him to come back to the Fletcher crypt, from which her body has mysteriously disappeared? Comments: Just as you can't judge a book by its cover, most of the time you can't judge a film by its title. 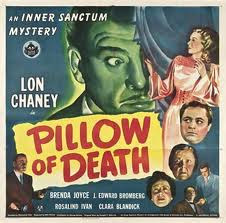 But in this case, the name Pillow of Death actually does say a lot about this entry in the Inner Sanctum series: that is, it's a bit sloppy, a bit hurried, and a more than a bit silly. For example, the film introduces some elements of a haunted house picture -- the inhabitants of the Kincaid mansion hear chains rattling and evil laughter from the attic, but no one is there. Squeaky doors open and close by themselves upstairs when no one is near them. But almost as soon as these plot elements are introduced they are explained away, indicating a movie that isn't sure where it's going. We get further evidence of this when we reach the rather far-fetched conclusion, in which Wayne Fletcher turns out to be a schizophrenic serial killer. It had to turn out that way, of course, because the screenwriters had written themselves into a corner. Everyone else had already been outed as red herrings. Nevertheless Pillow of Death is entertaining -- more so than the other Inner Sanctum mysteries we've seen -- and it's a bit more like a real horror movie than the others to boot. Lon Chaney, Jr was 38 when he filmed this movie but thanks to his hard-drinking lifestyle he looked about ten years older than that, and as a result, Donna seems altogether too young for him (of course, we could say the same for all the leading ladies in the series). Nevertheless he really is effective as the beleagured Wayne Fletcher. J. Edward Bromberg provides some light moments as Julian Julian. He gets most of the best lines and, oddly, speaks directly to the camera when he utters the final line of the film: "The word abracadabra is anathema to the true believer in the occult." It's a hard line to deliver with a straight face, and Bromberg, to his credit, doesn't really try. Like all the Inner Sanctum movies, the supporting cast is quite sturdy and the movie has a polished look beyond what its meager budget would lead you to expect. 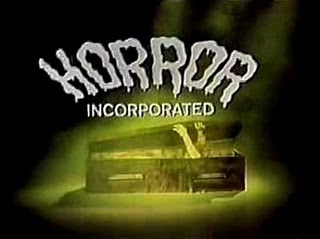 This was, incidentally, the last of the Inner Sanctum films to be produced....though not the last we shall see on Horror Incorporated. Last of the 6 INNER SANCTUMS, but curiously one that appeared far less frequently than the four other staples of SHOCK! (STRANGE CONFESSION remained unavailable until its video release). I'll admit it was a genuine surprise to find Chaney the culprit, since all the others presented him in victimized mode. The climax also provides a slight touch of the supernatural, which, like the rest of this entry, is part of a very wide canvas, most of it disappointing. 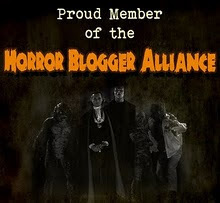 I cannot forget the obnoxious neighbor who resorts to body snatching to confirm his egomania. Jeez, his unpunished crimes were premeditated!